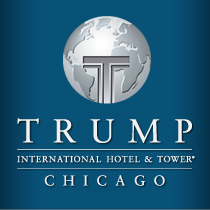 "Luxury is the common denominator at Sixteen, but with a sense of modernity and dynamism," says Bruno Roulleux, director of food & beverage at Trump International Hotel & Tower® Chicago. "From the daily-changing menu and presentation of the food, to the color scheme and even the serving pieces, no detail has been overlooked. We want our guests to leave feeling not just as though they have had a delicious meal, but that their meal at Sixteen has been filled with special touches they haven't experienced elsewhere." Located at Trump International Hotel & Tower® Chicago, Sixteen is a world-class, fine dining restaurant that has quickly become one of the city's most celebrated destinations. The restaurant serves breakfast, lunch and dinner in one of the most outstanding settings in the world. Sixteen's design represents a collaborative effort between Ivanka Trump and the architects, Joe Valerio and Randy Mattheis of the award winning Chicago architecture firm Valerio Dewalt Train Associates. The space defines a unique environment that celebrates modern American cuisine and the architecture of the city. A distinctive, full-service dining room designed by firm Valerio Dewalt Train Associates, Sixteen showcases modern American cuisine. From the 16th floor of the second-tallest building in the city, diners can enjoy panoramic views of Chicago's famous skyline, the Chicago River and Lake Michigan. The restaurant also provides a special vantage point from which to admire the architecturally significant Wrigley Building and its larger-than-life clock tower. When guests step off the elevators, a skyline view featuring the top of the Wrigley building is framed by two, floor-to-ceiling glass enclosed wine rooms, impressively displaying 465 red and 375 white wine bottles. Overhead, an amber glass ceiling bathes guests in warm light, and the French limestone floor draws guests towards the vista of some of Chicago's most famous buildings.